Dr. McDougall joined the University of British Columbia, Department of Urologic Sciences as Professor in February 2013 and serves as the Provincial Coordinator for Health Simulation Education for the Faculty of Medicine at UBC. She is internationally recognized for her laboratory and clinical research in urologic laparoscopic surgery and for teaching courses on fundamental and advanced endourological, laparoscopic, robotic surgery techniques. Dr. McDougall completed her medical and residency training at the University of Calgary and the University of Ottawa in Canada, and then undertook a fellowship in endourology and extracorporeal shock wave lithotripsy (ESWL) with Dr. Ralph Clayman at Washington University School of Medicine. She joined the faculty at Washington University Medical School in 1991, where she spent nine years in academic urology. Subsequently, she developed the Endourology/Laparoscopic Urology Program at Vanderbilt University in Nashville, Tennessee, during her tenure there as Professor of Urologic Surgery. In 2002 she became Professor of Urology at the University of California, Irvine where she developed the ongoing, five-day mini-residency training program in minimally invasive urologic surgery for post-graduate urologists. 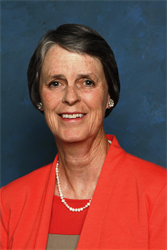 In addition, she served as the Director of the Surgical Education Center and Associate Dean of Simulation and Medical Education during which time she helped create a robust multidisciplinary and integrated health professional education program at UC Irvine. She is a Fellow of the Royal College of Surgeons of Canada (Urology) and certified with the American Board of Urology. Dr. McDougall has published more than 270 peer-reviewed journal articles and numerous book chapters. She is the co-editor of two textbooks on laparoscopic surgery. In 2008, Dr. McDougall successfully completed a Masters in Health Profession Education from the University of Illinois at Chicago.